Thank you very much, I'm happy to be here! I appreciate you having me! So, can you tell us what makes Lily Benitez tick? What got you started on the path to becoming an author? Oh man. I don't know where to begin about that. I just remember always loving to write ever since I was a little kid. I remember my earliest stories were about cats and dogs and they were about three sentences long. Writing and drawing has always been my favorite hobby. I've never been much of a gamer (in fact, scratch that, I'm NOT a gamer) and between playing outside and writing/drawing inside, I was set. I got the idea for Shinobi 7 when I was 13-ish, and I remember I had a 60-page long transcript of it. It was terrible, hahaha! It wasn't until I was 14 when I moved from Southern CA to Mississippi that I started writing Shinobi 7 more. I restarted and would write whenever I wanted to. Well, that went on for about two years of me writing the book on whims. Then when I was 16, I said to myself, “You know what? I wanna be an author, no question about it.” So THEN after that I buckled down and wrote the rest of Shinobi 7. In fact, I had the 2nd book finished by the time the 1st one was published. It was just the fact that I buckled down to write them. 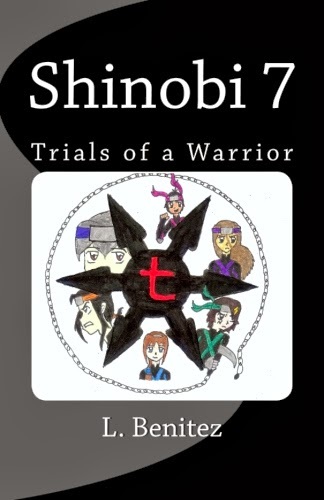 I'm currently writing Shinobi 7's 3rd installment. Yes, I have the 2nd one written and now I've got to: market the 1st book, edit the 2nd one, and write the 3rd. It's a lot to juggle but it's a lot of fun. I'm abusing post-it notes and there's a lot of notebook paper scraps around my room. I thought awhile about the snippet I'd share and what scene. So this is a snippet from Shinobi 7: Trials of a Warrior, Book #1 of my series. The book switches from 1st person to 1st person for different characters. For this scene, the character is a girl named Cassie and she's one of the main protagonists. This snippet is from her POV. Sorry if it's a bit out of context! picture form it, uh, says that.” I read out loud to Hanran. Read out loud? More like stuttered out loud! I'm such a dork! He nodded in response, which is all he’s given me so far. Not a single word. He wouldn’t even look at me. He even walks a few feet ahead of me because he has a faster walking pace. As I had dreaded, the atmosphere was horribly awkward for me. I’m not sure if Hanran felt awkward or not, he probably felt fine because of the silence. The only thing going through my mind was making it through today. I didn't want to say anything else to him unless I had to. Obviously he was cold to me because he didn't like me, although I can't figure out why. I've been nice to him the whole time. I expected the whole trip to be silent. Think of my surprise when Hanran actually said something to me. “What's your purpose for going to the Kitsune Clan?” he questioned. That was the first time he said more than a few words; his voice was gruff and husky, but still held adolescence in it, like he hadn't completely grown out of boyishness. His voice was nice to hear although I've barely heard it. Then I realized he was waiting for an answer. “To, uh, train there,” I answered softly. I didn't stammer as much, but I still sounded foolish. He continued walking ahead of me and his head stayed straight forward. Usually people look at the person they're talking to. I didn't expect him to reply. He surprised me a second time when he said in a darker tone, “You don't seem like the fighting type.” Hanran had apparently studied me and summed me up. Of course, I couldn't disagree with his conclusion. Just one more person I can hopefully prove wrong, right? “I... I'm not,” I mumbled softly. Even a complete stranger could tell I was way in over my head... maybe I am. “Why are you going?” I asked him. “To become stronger,” he answered simply. I should have known that would be Hanran's answer. He already looked like a fighter, or at least, he looked like he'd take fighting seriously. That's a really great question, actually. There's a character named Luna, and she's like my alter ego on the page. One reason I really had a lot of fun with this book is because I viewed as writing my life (and my friends' lives) inside a ninja school and all the trouble we'd get into, etc. Luna is just one main character, and I love them all equally, actually. The experiences and emotions the characters go through I can relate to some, although there are other instances where I do have to use my imagination in order to truly get into their character. My genre is typically action/adventure. I love writing fight scenes and anything that will get the reader's adrenaline pumping. My second favorite thing to write is humor, and it's the best feeling in the world when someone laughs at something I wrote. I feel special! I like action/comedy the best to write in and I find it the easiest out of all the genres. I don't think I'm very good at romance or mystery. In fact, suspense/thriller might be the genre I'm not so skilled in…because I'm not serious enough to write it out! However, one day I would like to challenge myself and write in genres and settings that I'm not so comfortable in that way I can practice and get more well-rounded as a writer. I'm inspired by different books or TV shows I watch. I have to be careful though because if I watch/read too much it'll serve as a distraction or will fickle me and my writing. When I get writer's block the best approach personally is to step back from the work and trust that an idea will come in time. So when I do get writer's block I'll watch my favorite movies or shows to get me distracted and then the inspiration will hit me once again. I never have writer's block for more than a week or so. I was in karate class and all the students were sparring each other. I was up to fight and an idea for a scene in my book suddenly hit me…then my sparring partner really hit me. I wasn't paying attention though so it was a good shot! I just remember being in a hurry to get home so I could write down the idea, I was afraid I'd forget it or something. Of course I didn't, I was being silly. Usually if a friend recommends it to me I'll check out a book. But if I'm on my own in a bookstore and I see a book, then usually if the summary grabs my attention I'm keen on reading it. Neil Gaiman, the author of Coraline. That's my favorite book and I love how simple it was but it was actually a lot deeper than one might initially think. I respect J.K. Rowling because the Harry Potter series was done her way and it felt like the package she gave us was hers, the way she intended it. That inspires me because with my book series I'd like to give the reader my book the way I intended for it. I have more authors I like but those are the two that come to my mind right now. I don't read a whole lot because I'm writing and I'm dedicating all my time to that. However, I do enjoy reading books from other indie authors like me. I'm 100% supportive of every author like me and it's great that I'm one of them now! I really love to practice Shotokan Karate, it's neck-and-neck with my writing actually. I like being outside in nature, especially now that the weather is fall. I love drawing because I've watched anime and read manga since I was a kid, so I enjoy drawing as well. One of these days I'm determined to make a comic. Cooking is another thing I enjoy; I have no set skill except grabbing ingredients, throwing them in a skillet, and making it taste good. Thank you so much for joining me here today, Lily. I know my followers will enjoy this spotlight as much as I have conducting it. Good luck on all your future endeavors. Thank you very much!!! I really enjoyed this interview and I'm very honored to have spoken with you, Harper. Good luck to you as well, I had fun! A world that used to be peaceful until the uprising of the evil geisha Black Rose and the ruthless warrior Rengoku. Together the two are the Blackthorn Clan and they have turned Shaaku Den into their battlefield, conquering and killing the innocent for their own gain. Blackthorn has instigated destruction and the only ones left to fight back is the surviving Kitsune Clan. Follow the adventures of six young individuals who are now soldiers in the legendary Kitsune Clan. Do they have what it takes to be a warrior and fight against Blackthorn? Can they save their world from Black Rose's evil thorns? This is a time of war in Shaaku Den— seen through the eyes of six unlikely youths. Will they overcome the trials of warfare?